New Selene explorer 49 bound for the US on a cargo ship. On May 12th, the brand new Selene 4942 has left the shipyard. The 34,200 kg were trucked at night by a special flatbed trailer. 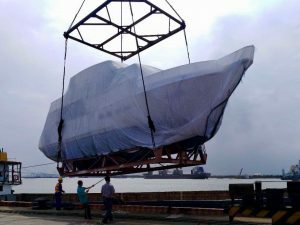 Then lifted onto a barge on the Pearl River bound to Hong Kong port where the yacht will be loaded on a container ship. She will reach her final destination in the USA in three weeks and be off-loaded on June, 1st. 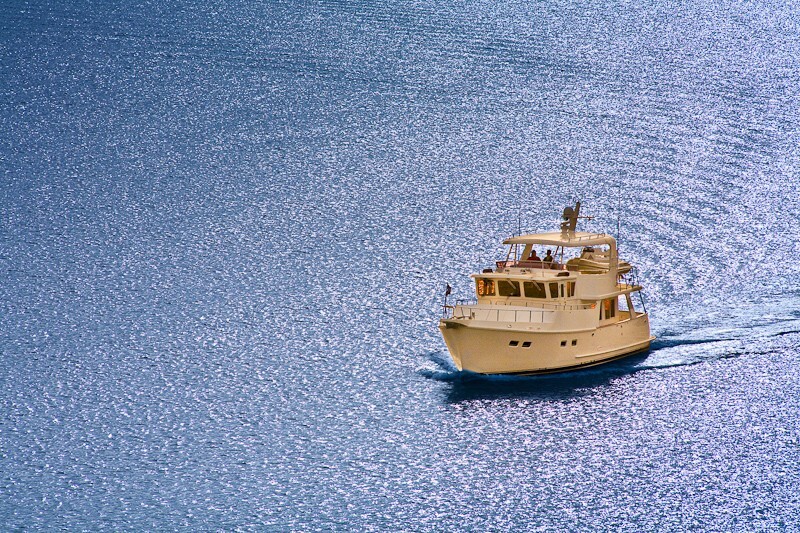 The Selene 49 is the flagship of the small Selene yachts. It is the next generation evolution of the very popular Selene 47. It features the Deep-Hull™ design and Cruiser Stern™, which improves headroom in the engine room and lazarette and makes the hull even more efficient than its predecessor. The Selene 49 has a very traditional « salty » look from the outside. Another significant difference is a wider flybridge giving space for entertaining friends and family with style in the open air, with ample room on the aft deck for a dinghy and hydraulic crane. 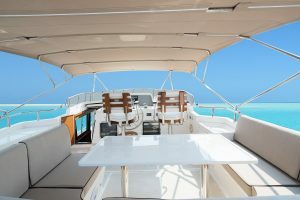 The flybridge layout with a canvas cover or a hard-top includes an L-shaped settee and table and a bar with sink and BBQ. The hull itself is deeper than the Selene 47 and is meant to carve through the water. The longer LOA of the Selene 49 translates to an 8” increase in the cockpit and 4” more in the salon. The living space is large and spacious for the long cruising days. The salon is luxuriously finished in teak. 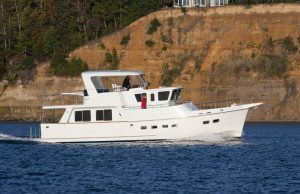 Past the L-shaped dinette for four, the U-shaped galley forward has granite countertops and modern appliances, including a full-size refrigerator with freezer. The two or three-stateroom accommodations down below are spacious, due to the full hull sections forward. The master stateroom has a queen-size island berth with teak and holly steps on both sides, plus two large cedar-lined hanging lockers. Headroom for the engine room has increased by a whole foot and the larger Cummins QSL 9.0 330 horsepower engine is standard. The Selene 49 is an excellent long range cruising boat with a D/L ratio at full load of 316, and A/B ratio at full load of 2.54. At 1,800 rpm, the Selene 49 has a cruising speed of 8.5 knots for a range of 2,000 nautical miles. The 49 also boasts an integral swim platform with a telescopic swim ladder, and beneath the 18″ hull extension Cruiser Stern™ there is extra room in the lazarette for storing gear and supplies, and at the same time greater buoyancy to offset the weight of the larger flybridge. As the flagship of the smaller Selenes, the Selene 49 boasts a level of luxury normally only found on its larger sisters in the range, but all in an affordable package that’s easy to handle as a couple.